With the start of the New Year it’s time to think about our taxes for last year. Decide on Day Care has some great child care tax tips for you to be sure you are prepared for this tax season. Day care can actually be a very good tax deduction but it is very important that you have all the right documents lined up and ready. Make sure to talk to your day care provider early to be sure that you’ll have all your documentation and information ready for taxes. If you’ve had multiple providers through the year, you’ll need to get a Tax ID Number (TIN) or their Social Security Number (SSN). The type of day care provider that you have will determine what kind of tax information you should get from them. A daycare center such as a preschool should have the appropriate tax paperwork available for their parents. If they child care center doesn’t offer it, just ask them for the information you need. You’ll need a receipt for the full year, their full business name, and their TIN. In home daycare providers know they need to provide this information to their clients as well. They should be able to provide you a receipt for your day care expenses for the year. Remember, they are running a business themselves and are required to track this information, but the accuracy and diligence vary widely from day care provider to day care provider. Be sure to ask for documentation with as much advance notice as possible so they have time to prepare the required paperwork. Ask for a receipt of your payments for the year, as well as their TIN or SSN. If your provider gives you her SSN, please be very careful with the number. If it’s written down, don’t include any other identifying information on the sheet (such as her name and date of birth), and destroy the paper once you have completed your taxes. You need to do your part to protect her from identity theft. If you have a nanny doing the childcare, it is up to you to document her earnings and take the appropriate taxes out throughout the year. You will need to file taxes as an employer, so this will be more complicated than enrolling your child in a day care center or privately run daycare. If you use a babysitter frequently this can also be deducted as a child care expense on your taxes for the year. Just be sure to keep track of when and how much in case you are audited. Often times if you do not have use frequent child care you may not meet the minimum needed for a deduction. It is a good idea to do a quick and dirty calculation of your day care expenses to see if it will be worth it for you to itemize your day care and child care deductions. Even if you don’t have full time daycare, you may still be able to deduct expenses relating to childcare. Look to your local tax code for the specifics but many offer tax breaks to help families with children. You will need to document your childcare expenses, but it’s also important not to let any other possible tax breaks slip through the cracks. If you’re planning to get a refund, you want to get all the information as soon as possible. Please be patient with your daycare provider if they are not getting the information to you as quickly as you would like. That’s not a problem if you end up owing money, but you definitely don’t want to wait until the very last minute to get the necessary information from your provider. You might also want to check with your employer to see if they offer a plan to take a certain amount of money out of your paycheck each month, pre-tax, and make that money available to you to pay your childcare provider. Since this money is taken out of your paycheck before taxes, it affects the amount of the childcare expense deduction you’re allowed to take. Be sure to check your local and Federal regulations and speak with tax professionals should you have complicated daycare taxes and expenses. Be sure that everything is documented and speak with those that were involved in your day care throughout the year. Taxes are different from household to household but many people forgo child care deductions they could be receiving. Day Care deductions can be maximized with easy to use TurboTax 2010. There are many great software solutions for taxes. Use the one that you are most comfortable if you decide to do your own taxes, but make sure you have the software that fits your particular needs. At www.decideondaycare.com, we like using TurboTax. It guides you through the process step by step and makes sure you’re not missing out on any deductions. 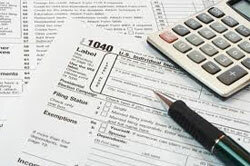 However, sometimes it’s best to leave complicated tax situations to the professionals.